Want to meet some of the friendliest, most approachable buildings in the city? You know them already, since they’ve been around longer than most of us. The thing is, they’re so good at being urban building blocks, we just don’t ‘see’ them any longer. And that’s a pity. So grab a coffee and one of most addictive chocolate chip cookies you’ll ever experience at Le Gourmand (152 Spadina Ave.) and meet me at the corner of Spadina Avenue and Adelaide Street West. Now look north. You’re standing at the gateway to what was, in the 1920s and 30s, Toronto’s booming garment district, and the two impressive buildings on either side of you were designed by the “relatively unknown” Benjamin Brown, the first registered Jewish architect in the city; at the end of our walk, I’ll deposit you at a gallery show that will blow your architouring socks off. 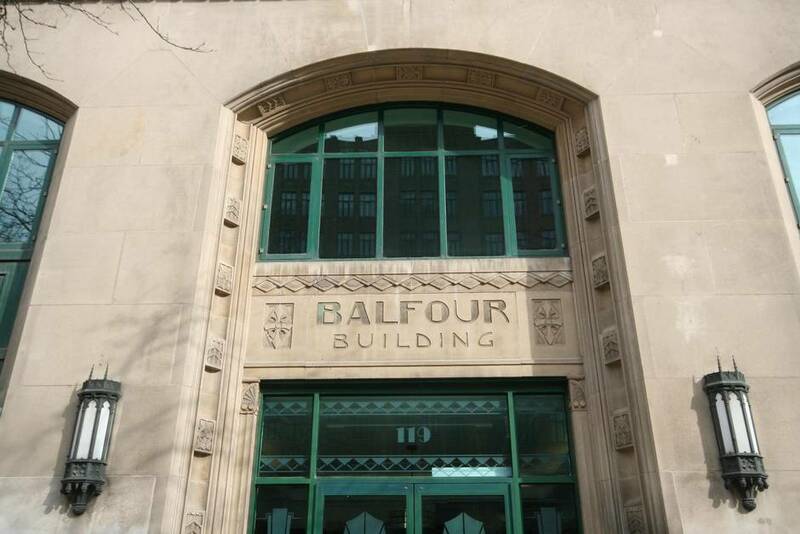 The 12-storey Balfour Building (1930), “arguably one of Brown’s most significant commissions,” according to curator Dara Solomon, is a lovely composition of buff brick and carved limestone. In a nod to the then-new Art Deco style, Cubist fan patterns decorate the parapet. But what’s really interesting is how well the building meets the street: five Gothic-inspired, arched openings – with the main entrance at centre – welcome pedestrians into small, inviting shops (last week, the Globe’s Marcus Gee complained that modern glass buildings are a “dud at the ground level” since they present us with “a blank, faceless wall” that usually contains just one retailer; today’s architects need look no further than Mr. Brown). On the roof, an elegant ‘penthouse’ was added to conceal the building’s water tower. 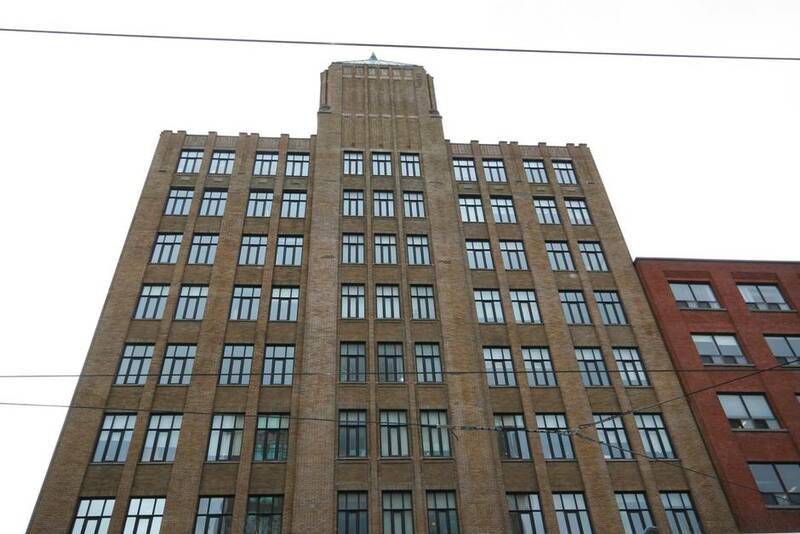 Across the street, the Tower Building (1928) sports a similar penthouse to hide water and mechanicals. It, too, has Gothic ornamentation and displays an effortless ability to meet the sidewalk. 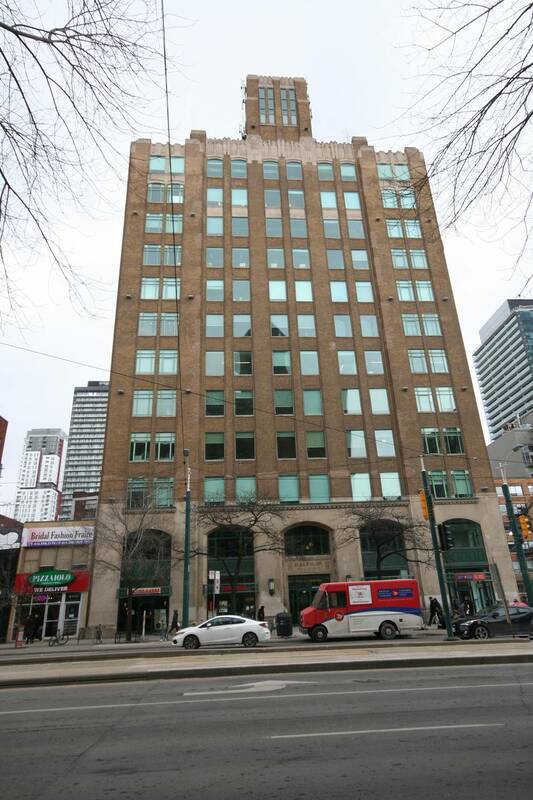 Its neighbour, the Reading Building (1925), also by Mr. Brown, is less ornate save for an oculus window over the entrance. Walk east along Adelaide now. At No. 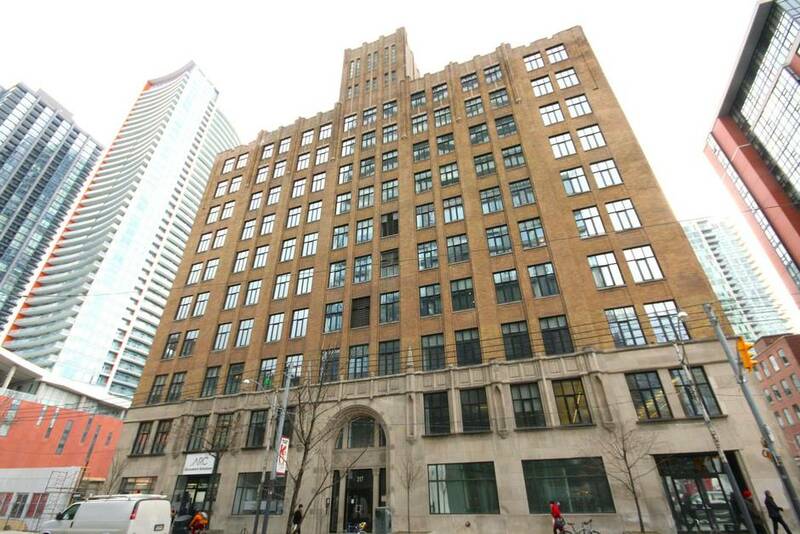 317 is the Commodore Building (1929), which shares many of the features of the Tower and Balfour buildings, including the slim penthouse. From here, we can either walk east to the New Textile Building at 205 Richmond St. W. (which has another great entranceway) or go north on Peter St. to 401 Richmond and Urbanspace Gallery. Let’s choose the latter. Benjamin Brown (1888-1974), we’ll find out, came to Canada from Lithuania around 1896. His parents were working-class and struggled to make ends meet, so young Benjamin cut his education short to take a job at a garment factory. He dreamed of life as a painter, however, so he eventually enrolled at the Central Ontario School of Art and Design (now OCAD-U). However, unable to afford a European tour to complete his studies, he reconsidered and began studying architecture at the University of Toronto. He graduated in 1913 and was soon designing townhouses on Beverley Street for a Jewish developer. Of course, Mr. Brown, who retired in 1955, would move up the design ladder as his clients climbed the socio-economic ladder. The exhibit expertly traces this trajectory by showing early commissions for diminutive storefronts – one complete with the geometric pattern for the terrazzo ‘apron’ outside the front door – to a design for the women’s clothing store chain Cherry’s, and then to his earliest industrial buildings. 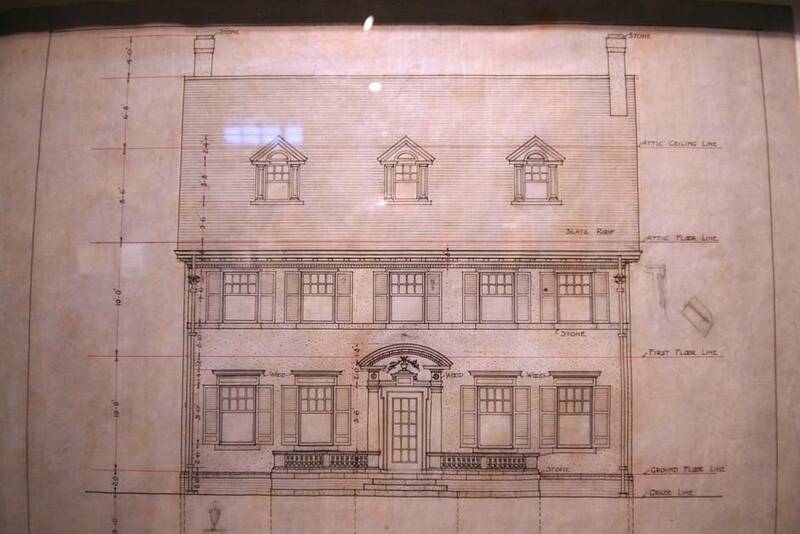 Mr. Brown would also design a three-storey Georgian mansion for Mendel Granatstein at 42 St. George St. in 1919. Beginning his career in the rag-sorting trade in 1895, Mr. Granatstein was so successful by the late-teens he formed part of the group that oversaw the construction of the purpose-built and very impressive Beth Jacob Synagogue at 23 Henry St. (also by Mr. Brown). The Granatstein home, interestingly, had a retractable roof over an enclosed porch so the family could use it as a sukkah during Sukkot. Today, only the entrance portico remains in the lobby of the University of Toronto’s Bahen Centre for Information Technology. Over the course of his career, Mr. Brown would design over 40 private residences and apartment houses, and work on interior renovations for clients such as wool merchant Louis Gelber (his name can be found on a ‘ghost sign’ at the south-west corner of Richmond and Duncan) and Tip Top Tailors founder David Dunkelman. 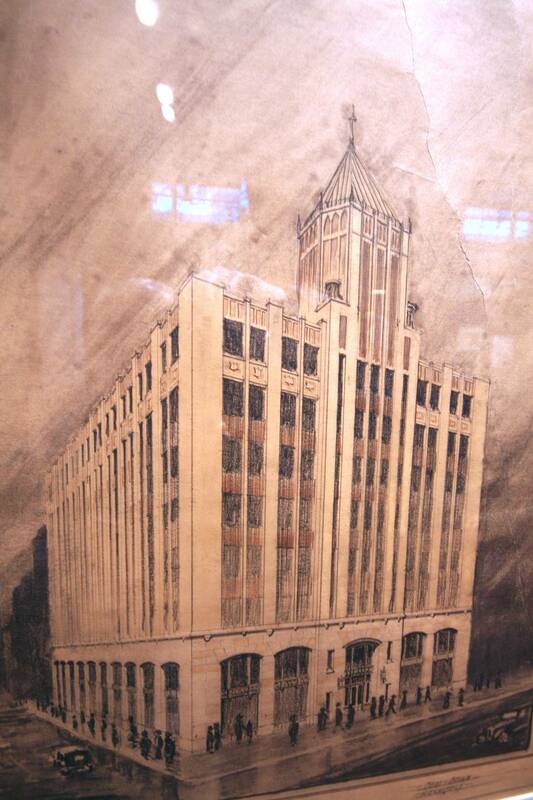 But rather than labour over which buildings remain and which have been lost, curator Ms. Solomon, Director of the Ontario Jewish Archives, says Mr. Brown’s architectural drawings and body of work speaks for itself: “Hopefully it will inspire interest, and people can then go check it out themselves,” she offers. A large whimsical wall-map by illustrator Daniel Rotsztain points gallery-goers to other Brown works, such as the 1930 Tudor home Mr. Brown designed for himself and his Danish bride at 37 Castle Frank Cres. (but lived in for only a few years due to a broken heart) and the 1920 Primrose Club. 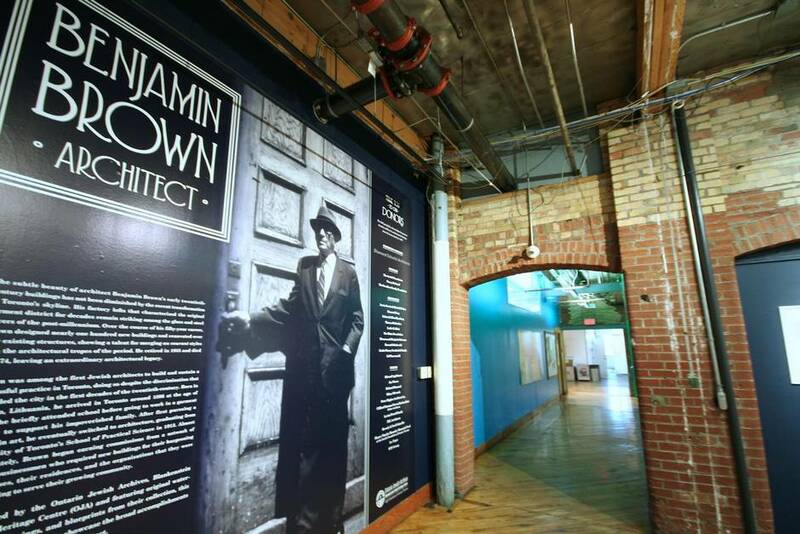 With this exhibit, Benjamin Brown takes his rightful place alongside Edward J. Lennox, John M. Lyle, Frank Darling, John Pearson and other Toronto city-builders of the first half of the twentieth century. Benjamin Brown, Architect runs until April 23, 2016 at Urbanspace Gallery, 401 Richmond St. W. Gallery is open Monday to Saturday from 9 a.m. to 7 p.m.